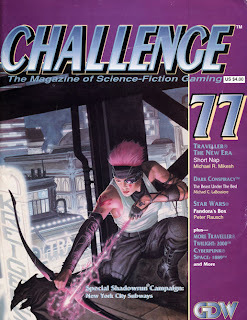 Those of you who have been gaming longer than 15 years will probably have come across the magazine Challenge that was put out by Game Designer's Workshop. Started in 1986 the title was intended by GDW to be their in-house magazine to support their own game lines. At the point that Challenge was being set up, GDW only had magazine style support for the Traveller line in the form of the Journal of the Traveller's Aid Society. The JTAS (as it was known) was a digest sized magazine that fitted the format of the rest of the Traveller line but there was a desire for something larger that could provide larger deck plans, world maps, better illustrations and cover more than one game. With Twilight 2000 having been released in 1984 there was a growing need for greater coverage and rather than having a separate magazine for each line a combined format was a better solution. The format arrived at was a standard magazine format of 8.5" by 11". When initially released it was Challenge Magazine: GDW's Magazine of Adventure Gaming Incorporating the Journal of the Traveller's Aid Society. Since the last issue of JTAS published before the new format was #24 the decision was made to continue the numbering scheme. 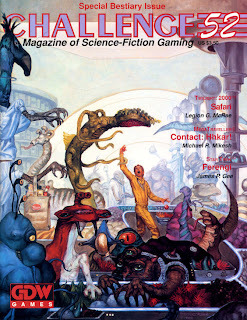 Issue 25's 48 pages covered both Traveller and Twilight 2000 articles, with the Traveller JTAS sectioned off in the magazine for those who were only interested in that setting. A highlight of the issue was a draft of minatures rules for Twilight 2000 and, amusing to look back on it now, a page of code in Applesoft Basic for the Apple II for a sector generator. Cutely it even had you type in remarks to indicate that it was copyright GDW. Oh the days, well it was 27 years ago. 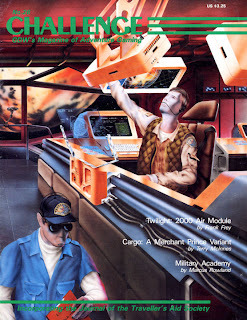 The magazine continued to support solely Traveller and Twilight 2000 until issue 27 where support for their new title Traveller: 2300 (it was a while before they dropped the Traveller from the name) was added. In these days the title increased from it's initial 48 pages for #25 to 52 pages from #26 onwards. Issue 30 was the first time they published articles on non-GDW house titles, in this case it was an article on Building the Perfect 'Mech for FASA's Battletech game. It was at this point that the magazine size increased to 68 pages. 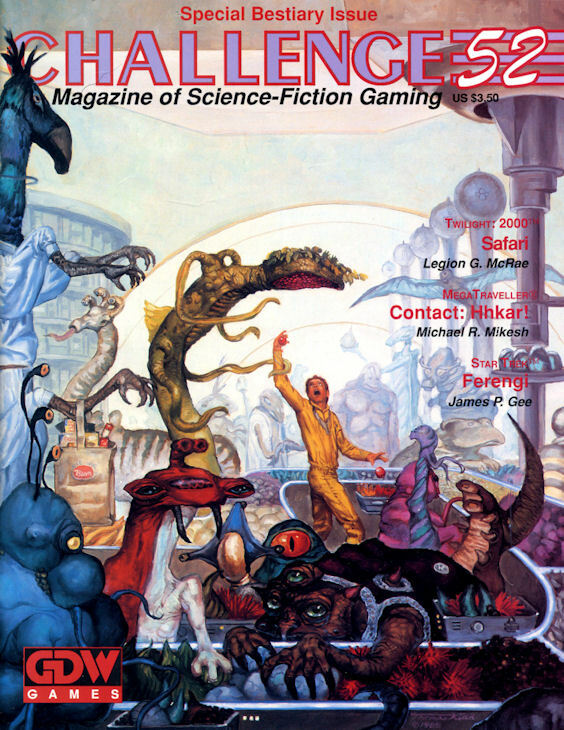 Over the rest of the run the magazine added more and more articles on other games and began to become more of a general RPG magazine for science-fiction gaming (incidentally something in the original JTAS #22 announcement they stated wouldn't happen.) Over the years to follow the size of the magazine would fluctuate usually between 84 to 100 pages in size with non-GDW game lines taking up more and more space. It proved to be very popular with the fans and print numbers increased steadily through it's lifespan. The tagline Incorporating the Journal of the Traveller's Aid Society was dropped with issue 34. Occasionally they would have themed issues, such as #46's Horror Issue, #52's Bestiary Issue or #59 Mysteries Issue. Unfortunately production of the magazine ceased with the closing of GDW in 1996 after issue 77 was distributed. The closure was claimed as financial difficulties by designers and freelancers but Marc Miller attributed a lot of it to burnout of too much pace sustained over too long a period of time. All in all it was a great run for a great magazine. Varied and generally of very high quality I recommend you check it out if you ever get the chance to pick up some hard copies. They generally circulate on eBay for relatively low prices, usually cover price or less. If PDF is more your thing then they are all available on DriveThruRPG.com for $2.44 or $3.00 each. Alternatively if you want them all then for the excellent price of $34.00 (that's 64c each) you can get the entire collection.